Summary: Inconsistencies and manipulation of Saudi government economic data online are fuelling claims that the royal family is misappropriating the national wealth. At the same time however, strange things have been happening to official Saudi economic data online raising questions about the true state of the Kingdom’s economy. Earlier this month the General Authority for Statistics (GAS) in Saudi Arabia published their Annual Yearbook 2016 with new, much larger figures for Saudi state revenue than previously published, drawn from both the oil and non-oil sector. The new figures say actual government revenue in 2016 was SAR1.038 billion or USD$277 billion, which is roughly USD$140 billion more than – nearly double – the previous official figure. The new GAS figures include a far higher than previously thought figure for Saudi government non-oil revenue: SAR 437408 million (approximately USD$120 billion) when according to Bloomberg non-oil revenue in 2016 had previously been thought to be around SAR 199 billion ($53 billion). When Saudi activists on social media drew attention to these enormous, unexplained discrepancies earlier this month the data on the GAS website was quickly changed back so it fitted the old official version again. However not all the figures on every document were changed and at the time of writing the higher figure can still be found in the GAS Annual Yearbook 2016. 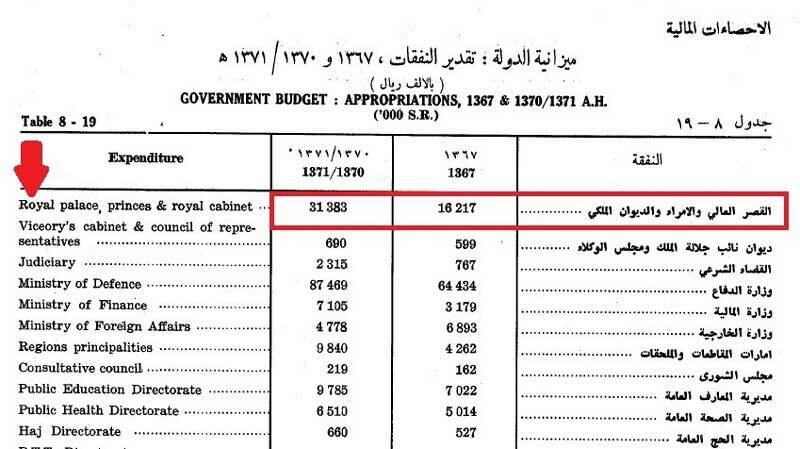 Critics of the government say the new figures are evidence of misappropriation by the royal family on a grand scale and that on average SAR 500-600 billion (USD $133 billion) goes missing from the budget annually. They claim that what happened in this case is that as the Kingdom opens up in preparation for the Aramco IPO some state organs are becoming transparent faster than others and GAS inadvertently let secrets slip. 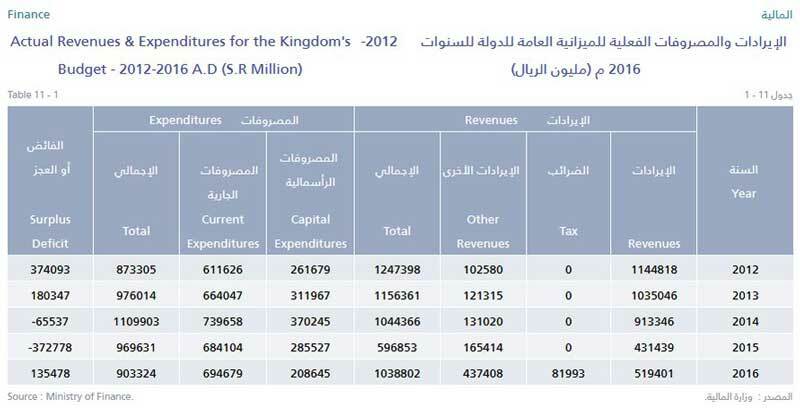 So what is the truth about Saudi government revenue and spending in Saudi Arabia? Since taxes and other austerity measures were introduced in 2015 Saudis have been enjoying debating these issues in cyberspace. In his post Dr Hamza claimed that according to the government’s own figures SAR1.1 trillion ($267 bn) had vanished in 18 months from state coffers. A few days later Dr Hamza was charged with defamation but after a public outcry on Twitter, with hashtags like “one trillion” trending, the case against him was dropped. Online the debate continues. Some, like this Kuwaiti economist and this Saudi economist on Twitter, support Dr Hamza. Others say he has his figures wrong or misinterpreted the official data. Dr Hamza has said he was only using the government’s own figures which are probably wrong anyway. Fifty years ago royal family stipends were still listed in the state budget. This practice has long since been abandoned and Saudi Arabia today is ranked last in the world for budget transparency. What is more surprising perhaps is that, in public at least, no one in the west – governments, financial institutions or ratings agencies – appears to be trying to count how much the royal family skims off. Given that the amount could be quite large, one would think this a significant factor when assessing the overall health of the Saudi economy. State Dept cables released by Wikileaks however show that behind closed doors the US government is trying to estimate how much the royal family takes. Presumably the sums involved have increased considerably since this secret cable was written in 1996. In September 2015 an anonymous grandson of Ibn Saud published a letter calling for the downfall of the King in which he warned that large sums of money are being embezzled by the inner circle of the royal family. The letter stated that USD$160 billion (SAR 600 billion) is taken by the leadership with a further USD$100 billion (SAR 375 billion riyals) allegedly going directly to Mohammad bin Salman and his brothers, Turki, Khaled, Nayif, Bandar, and Rakan. Revenue from 2 million bpd of crude oil was also alleged to be being sent to an account belonging to Mohammed bin Salman, in the name of the King. The Saudi government deny the royal family receive any income at all from Aramco. Online polls on social media suggest many Saudis do not believe them.